What is the JFK Assassination Magic Bullet Theory? 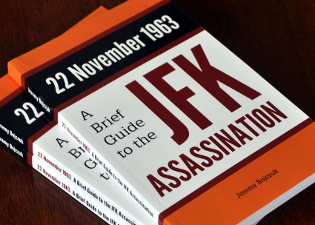 You are here: Home › Further Reading › JFK Assassination FAQs › What is the Magic Bullet Theory? Commission Exhibit 399, the 'magic bullet', must have wandered up and down when passing through two bodies, smashing bones and emerging unscathed at the other end. Newcomers to the JFK assassination are sometimes confused by the terms ‘single–bullet theory’ and ‘magic bullet theory’. Do these terms refer to the same thing? Or is the magic bullet theory different from the single–bullet theory? About seven weeks before the assassination, a man calling himself Lee Oswald had visited the Soviet Consulate in Mexico City, where he met an official who was suspected by the CIA of being a member of the KGB’s assassination department. The obvious implication was that the Soviet regime had been involved in President Kennedy’s assassination. The man in Mexico City who had claimed to be Oswald was probably an impostor. The implication now was that the Soviets had been falsely implicated, presumably by individuals or groups within the US security apparatus. or elements within the wider US political system were behind the assassination. These theories signified the erosion of the public’s trust in established institutions, and threatened the existing distribution of domestic political power. There was only one acceptable solution to the assassination: Lee Harvey Oswald had killed President Kennedy alone, and he had done so for no political or ideological motive. The thing I am concerned about, and so is Mr Katzenbach, is having something issued so that we can convince the public that Oswald is the real assassin. Mr Katzenbach thinks that the President might appoint a Presidential Commission of three outstanding citizens to make a determination. The public must be satisfied that Oswald was the assassin; that he did not have confederates who are still at large; and that the evidence was such that he would have been convicted at trial. We need something to head off public speculation or Congressional hearings of the wrong sort. The Warren Commission was set up on 29 November, with the purpose of making a convincing case that Oswald was the lone assassin. Although Lee Harvey Oswald was inside the Texas School Book Depository during the shooting, there is no credible evidence that he was on the sixth floor, where bullet shells and a rifle were found. What evidence there is suggests that he was on either the first or second floor. Around 40 witnesses claimed that at least one shot had come from the grassy knoll, which was in front of President Kennedy. The TSBD was behind the motorcade. The Zapruder film, with its depiction of Kennedy’s back–and–to–the–left movement in reaction to being shot in the head, suggested very strongly that the fatal bullet had been fired from the general direction of the knoll. The doctors who examined President Kennedy in Parkland Hospital claimed that the president’s throat wound was the result of a shot from in front. and James Tague was wounded on his cheek. One bullet must have caused only James Tague’s wound. Tague was standing too far away to have been struck by a fragment of a bullet that had hit either Kennedy or Connally. One bullet must have caused only President Kennedy’s fatal head wound. Films of the assassination show that Kennedy was hit in the head after he and Connally had reacted to their non–fatal wounds. The remaining bullet must therefore have caused all the non–fatal wounds to Kennedy and Connally by passing through Kennedy’s torso from back to front, passing through Connally’s torso from back to front, passing through Connally’s wrist, and finally entering Connally’s thigh. That is the single–bullet theory: the notion that one bullet caused six non–fatal wounds. Governor Connally was adamant that he was shot in the back after JFK had already been wounded (see Warren Commission Hearings , vol.4, pp.135f). The Zapruder film shows Connally reacting to his back wound after JFK reacts to his throat wound, and shows him gripping his hat long after his wrist is supposed to have been shattered. President Kennedy’s back wound was located lower than his throat wound. Both wounds could not have been caused by one shot from the sixth floor of the TSBD, which was 60 feet (18 metres) above the road. The necessity for the bullet to have changed direction twice: on entering President Kennedy’s back, in order to come out of his throat, and again on exiting his throat in order to hit Governor Connally close to his right armpit. Commission Exhibit 399, the bullet introduced into evidence, had sustained too little damage to be a credible candidate for the role of the magic bullet. The US Army carried out test firings of similar bullets into the wrists of human cadavers. All of the test bullets sustained substantial damage. More metal was retrieved from Governor Connally’s body than was missing from the CE 399 bullet. The CE 399 bullet had apparently been discovered on a stretcher outside the operating theatre while Connally was undergoing emergency surgery. The hospital employee who found the bullet claimed that the stretcher in question was not that of Connally. The bullet that had been entered into evidence was not in fact the one that had been found on the stretcher; see Gary Aguilar and Josiah Thompson, ‘The Magic Bullet: Even More Magical Than We Knew’ at history–matters.com. Single–Bullet Theory or Magic Bullet Theory? Critics of the Warren Report often use the term ‘magic bullet theory’ rather than ‘single–bullet theory’ because the former emphasises the sheer implausibility of the notion that one particular bullet, which sustained hardly any damage, was able to cause one particular set of wounds in such an unlikely manner. What Did the Warren Commission Say about Jack Ruby?